Today’s story is a tale of community empowerment. The Mogens’ story is a familiar one if you’ve been following this blog: a rural landowner completely surprised by the sudden impact of oil and gas drilling. What is inspiring here is the way they worked with their community to fight back, and to gain concessions from local government, the state and the drilling company. A particularly appropriate story given this week’s events in Belfry. When Kristi Mogen and her family moved to the Douglas, Wyoming area in 2004, she thought she’d found an ideal spot. Her daughters Katie and Kylee could get the special care they needed. Katie has epilepsy and Kylee has Aspergers Syndrome. Kristi also wanted to control her family’s exposure to chemicals that could affect the health of her daughters. The 15-acre ranchette she and her husband Pete bought was clean, free of chemical fertilizers, herbicides, and pesticides, so she could grow organic food and raise grass-fed Dexter cattle, a smaller breed that produces milk that eases Katie’s seizures. Life was peaceful. The family enjoyed the front porch views of Laramie Peak Mountain Range and beautiful Wyoming sunsets. Kristi wasn’t overly concerned about living near oil operations. 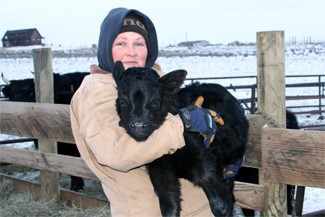 She grew up around the industry in northeastern Montana. Her dad worked in oil, as did her mom and husband Pete. On April 24, 2012 a Chesapeake Energy Corporation oil well blew out near Douglas. The broken well spewed gas and vaporized drilling mud full of toxic chemicals for three days. Kristi had gone to town when the well blew on April 24. Pete, Katie and Kylee were working in the yard, just under two miles downwind of the blowout. At first, Chesapeake and the sheriff’s department told everyone it was safe. Later that evening, the Converse County Emergency Manager called for an evacuation. “It was the first evacuation in Converse County in history,” Kristi said. The family left, covering themselves in protective clothing, hats, gloves, sunglasses and bandanas before driving away with the windows closed. Kristi’s years of hard work to protect her daughters from chemical exposure was undone in an instant. The next day the Mogen family developed nosebleeds. The youngest daughter endured 29 straight days of nosebleeds. Blood tests later in the year showed that Pete, an Iraq War veteran, did not have detectable levels of testosterone. But that wasn’t the end of it. Beginning in May, four wells flared uncontrollably for six months, releasing huge plumes of black smoke. Three flaring wells were within a mile of Kristi’s home. “The noise was thunderous. It shook our walls. It shook our vehicles as we drove by. You couldn’t have open windows when you drove by the flares,” she said. Since the blowout, Chesapeake has continued to vent and flare pollution into the air. Despite a community uproar, state regulators with the Wyoming Oil and Gas Conservation Commission (WOGCC) have fined Chesapeake a mere $1,000. This is not surprising. The Wyoming Department of Environmental Quality pursued water quality fines against only 10 producers in 2012, out of 204 recorded oil and gas production spills. Prior to her experience with Chesapeake and the WOGCC, Kristi was a supporter of the oil and gas industry and thought that regulation of the industry should be left to the states. She doesn’t believe that anymore. Frustrated by lack of action by state agencies, Kristi got involved in local efforts for change. She joined the Powder River Basin Resource Council based in Sheridan. She participated in a Principles of Community Organizing training workshop put on by the Western Organization of Resource Councils. She traveled to Washington, DC and met with key Congressional offices and administration officials to push for stronger protections from gas flaring and releases and other reforms to oil and gas operations. They got the Converse County Commissioners to support a severance tax on flared gas. The got Chesapeake to cut flaring. 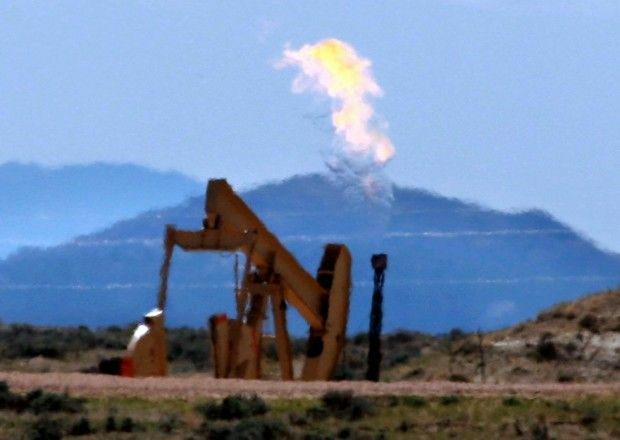 They have peitioned the Wyoming Oil and gas Conservation Commission to increase well setbacks from 350 feet to 1350 feet from homes and schools and tighten the limits on flaring, venting and fugitive emissions. We see the same thing over and over again. Unsuspecting people in rural areas get overwhelmed by oil and gas drilling that they never anticipated. As a result their lives change dramatically overnight. Their water is contaminated, the air they breathe is fouled, their animals are harmed, and their entire way of life is threatened. They look to state government for help, and there is none. The only way to for landowners to protect their property rights and control their own destiny is to work together to change local laws to protect themselves. That’s what Kristi Mogen is doing. It’s what residents of Carbon and Stillwater Counties need to do too. This entry was posted in Personal stories and tagged Chesapeake, community organization, Flaring, Kathi Mogen, personal stories, WOGCC, Wyoming, Wyoming Department of Environmental Quality, Wyoming Oil and Gas Conservation Commission. Bookmark the permalink.